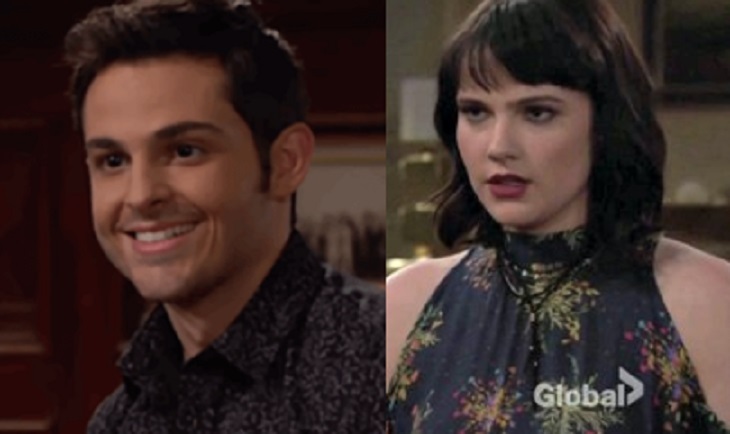 The Young and the Restless rumors indicate that Fen’s (Zach Tinker) return home will reveal a connection to another of Genoa City’s younger residents. Fen returned to town this week and dropped a bombshell on parents when he revealed he wants to quit law school to become a singer. While Laruen (Tracey Bregman) was supportive of his choice, Michael (Christian LeBlanc) wasn’t thrilled. Michael and Lauren may not be the only people whose lives are turned upside down due to Fen. The youngest Baldwin claimed his musical aspirations started when he began dating a musician. The young girl turned Fen onto music and encouraged him to follow his real dream. Fen’s new passion for music has led to speculation that the girl is Tessa (Cait Fairbanks). Before she turned into a blackmailer, Tessa was a struggling musician, who performed outside Crimson Lights to make ends meet. After her record deal fell through, Tessa has been bouncing around jobs to earn money to rescue her sister. Her latest attempt to blackmail Victoria (Amelia Heinle) about JT’s (Thad Luckinbill) murder didn’t go over so well. It also lead to problems with her and Mariah (Camryn Grimes). Despite Mariah’s attempt to forgive and work on their relationship, there’s still trouble with the couple. Things will probably get worse when Mariah learns that Fen is Tessa’s ex-boyfriend. Y&R viewers will remember that at one point, Tessa was calling and texting a mystery man. However, since she began dating Mariah, nothing much was mentioned about the mysterious caller. But could it have been Fen that Tessa was in contact with? If so, maybe things aren’t over with the couple. With Fen wanting to pursue a musical career, he’ll need Tessa’s help. That’ll mean the two working closely together, which could lead to sparks reigniting. Is Tessa Fen’s ex-girlfriend? Will the couple reunite now that Fen’s in Genoa City? Plus, how will Mariah feel about Fen being Tessa’s ex? General Hospital Rumors: Sasha Missing – Ryan’s Next Victim?